There is no doubt in proficient oratory skills of Mr Modi. Even his opponents flabbergasted by his ability to mesmerize and hypnotize his audience are unable to bring someone matching to his skills. 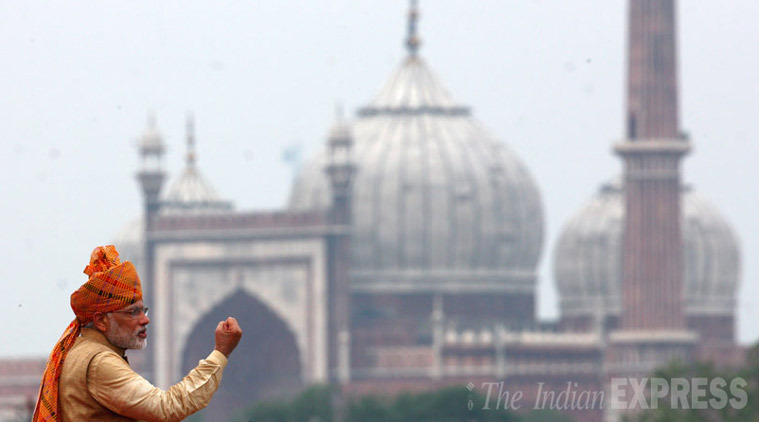 Yesterday in his second speech from the Red Fort after flag hoisting he was impressive not only for maintaining his energy in such a humid Delhi atmosphere but for delivering an unwritten speech without any teleprompter and bulletproof screen protection. His speech mainly covered his achievements of the previous year which are contradictory as compare to the real ground situation. For instance more than 90% of the account opened through Pradhanmantri Jan Dhan Yojana (18 crore approx.) have zero balance in them. Those functional have not received Rs 5000 loan promised after six month's transaction and the 1 lakh insurance was only receivable in accidental deaths. Target of toilets in all primary schools is also not achieved yet. Sansad Adarsh Gram Yojana to adopt an develop a village in his/her area by an MP is also under clouds for not getting any directions for the same. More than 100 MP's haven't adopt a village and those who have adopted the villages haven't done much in the area. There is no employment generation which is a clear indicator of failing of Make In India and Skill India in already slow indigenous Indian market. If you are an Internet user than you can judge the best about success claims of Digital India initiative which is incomplete without nationwide Internet coverage and enhanced net speed. The Indian roads, railways, public toilet could explain better about Swach Bharat (Clean India Mission.) The rate of crimes against women is also high. Looking at the conditions of previous year's announcements recent declaration about Start Up India, Stand Up India and giving electricity to 1.8 lakh villages 1000 days appears only dreams. From his journey as PM candidate till now he was selling only dreams to the people of India. Dreams for which he don't have some solid program and policy. It is easy to say than to fulfill which he even admitted during his Mann Ki Baat on the issue of One Rank One Pension. He said that he made the promise to implement it after becoming PM without reading its implications. The application and announcement are two different things. It is easy to announce things to win people's heart but difficult to make it a reality. The bullet train needs 25 years, Yoga is a personal choice and moral teachings best works in India with strict law only. Moreover, the man who speak so much against corruption, communalism, castism,women safety and other such things remain silent when these things practiced by people within his own party and government. He didn't bother to attend parliament during discussions on these issues. Mr Dream Merchant one can forget and forgive a person who break one's leg but not the person who break dreams. Dreams keep alive the hope and trust in us, if they break we left broken without them. Take all safety precautions because you are playing with fire. The real independence reside where people have more powers than leaders. They should have say in law making, they should have power to ask questions and they must be protected by law equally. So we are still slaves at hands of few in the power. This post is linked to Indispire Edition #78 an initiative by Indiblogger. I am glad someone sees what I see. He is just a smooth-talker.